Wightman Builders Ltd are a local building and construction firm having been established for over 14 years trading in and around Exeter and the East Devon area and have built up a reputation for quality service and the highest level of customer care at very competitive prices. We offer a wide range of services including: Extensions, garage conversions, barn conversions, conservatories & sun houses, alterations and refurbishments, kitchens, bathrooms, drives and patios. We work with private customers and liaise with architects to offer a wide range of planning, design and building services. We know that having any work carried out on your property can be stressful so it is important you choose a company you can trust. Our team of experienced builders, tradesmen and contractors are reliable, trustworthy and the company is a member of the Federation of Master Builders. 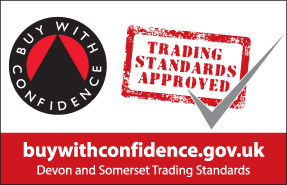 We have also earnt the Trust Mark Government Award and are also members of the Devon County Council ‘Buy with confidence’ scheme so you can rest assured that our business is vetted and approved by Trading Standards who ensure we operate in a legal, honest and fair way.